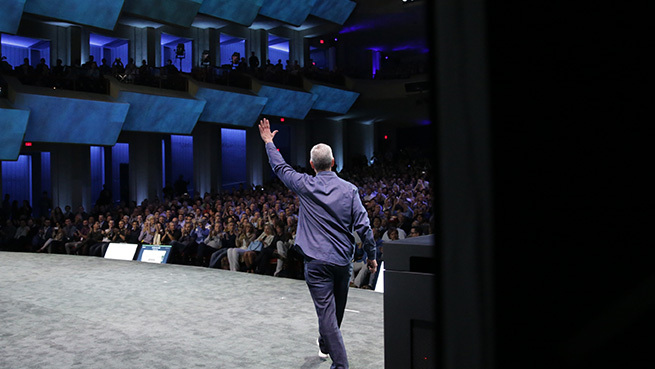 Tim Cook kicked off September’s Apple Event with a brief history of the venue. The Flint Center of Performing Arts has hosted three Apple events in the past, including the original Macintosh and the iMac. New iPhones were unveiled after only 10 minutes, earlier than ever before during an Apple event. 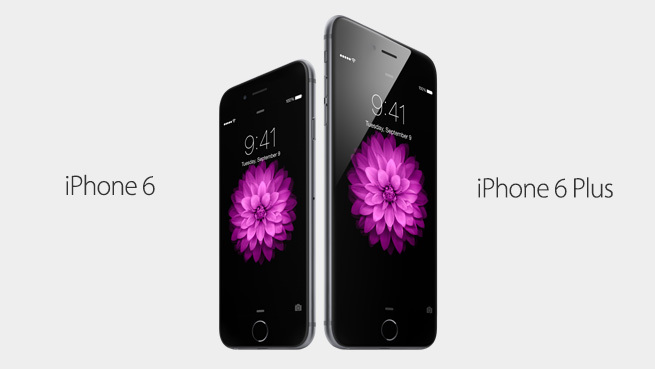 The iPhone 6 and iPhone 6 Plus were shown in a short introduction video. They both feature larger displays at 4.7″ and 5.5″. These screens have an all-new Retina HD Display, at 1334×750 pixels with 326 pixels per inch for the 4.7″, and full 1920x1080p on the 5.5″ with 401 pixels per inch. The new design brings a thinner profile, a standard at Apple for new hardware. Both models are significantly slimmer than the 5s, which is at 7.6mm. 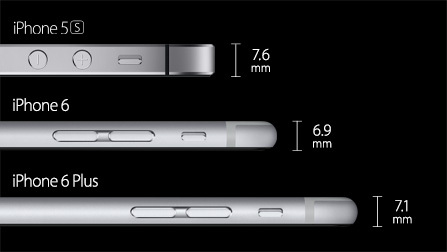 The iPhone 6 is measured at 6.9mm, and 7.1mm for the iPhone 6 Plus. The rounded corner style takes cues from the iPod Touch. A new landscape view has been crafted for the larger 5.5″ display, giving users the option to rotate apps similar to an iPad for a greater view of their content. Weather, Messages, and Mail were demoed during the conference to show the new arrangement. Even the Home Screen can now be rotated to landscape. Internally, the iPhone 6 features a new A8 processor. This 64-bit powerhouse provides 25% faster performance and 50% better graphics capabilities than the iPhone 5s. A demo for Metal was shown by Super Evil Megacorp, an indie studio creating a game from the ground up for the iPhone 6. Metal allows developers to utilize the graphics processor at a higher level to significantly increase performance and create stunningly detailed worlds. Their first game, Vainglory, is a MOBA experience specifically crafted for touch devices. Apple’s M8 co-processor received an upgrade as well, adding in a full barometer to the list of movement detection sensors. This allows the capture of information for distance and elevation. The iPhone 6 is 50x faster in performance and 84x faster in graphics than the original iPhone. It is also 50% more energy efficient, providing as good or better battery lifespan in every category. Network connectivity is getting a boost with VoLTE and Wi-Fi AC support. Wi-Fi calling allows users to make calls over a local network when cellular reception is poor. This feature is different than Facetime Audio as it uses phone numbers opposed to an Apple ID to make the call. It does require carrier partnership and will become available in the near future. The camera system now features DSLR quality features, including Focus Pixel technology and enhanced sensors for autofocus, tone mapping, and noise reduction. It can now focus up to 2x faster than before. A new burst mode on the front camera can detect smiles and blinks for group shots, and recommends the best one after. Video can now record in 1080p at 30 or 60 fps, and now 240fps alongside 120fps. This allows extreme slow-mo recording to capture precise detail during fast-moving scenes. It also helps with video and image stabilization. The Focus Pixels feature provides automatic and undetectable focus changes during video recording. Internal storage capacities are changing for the first time since the iPhone 4s launch in 2011. 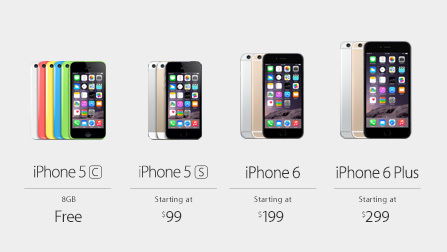 The iPhone 6 will start a $199 for a 16GB, and now has a 64GB model at $299, followed by a new 128GB version at $399. 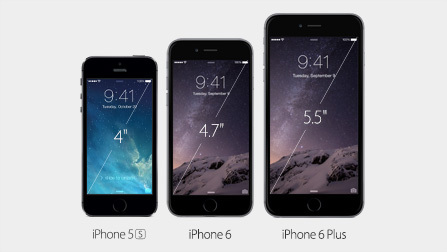 The 5.5″ iPhone 6 Plus will be available at $299/$399/$499 for the same 16/64/128GB sizes. These prices are all on 2 year contracts through a mobile carrier. New leather and silicone cases were introduced for both sizes, similar to the Apple branded ones for the iPhone 5 and 5s. The iPhone 6 and iPhone 6 Plus will launch on Friday, September 19, with pre-orders starting this Friday, September 12. Nine countries will have it on day one including USA, Canada, UK, France, Germany, Australia, Hong Kong, Singapore, and Japan. Over 100 more are planned before the end of the year. Tim Cook returned to the stage to talk about a new system they are launching in October called Apple Pay. This new payment method will begin the extinction of plastic cards and migrate them into a mobile device. This extremely secure system will integrate your credit cards into digital forms within the phone. The camera is used to take a snapshot of the card and then verifies it with the bank. Once this is completed, the user will have full access to the card by utilizing Touch ID. The iPhone 6 has NFC built-in and communicates to mobile payment terminals located in retail stores. The security is refined by a method that Apple has implemented to keep information private. The store does not ever see your name, card number, or security code. Apple will authenticate the purchase with a one-time unique number to the merchant and then confirms it with the bank. Apple is not able to see what you bought, where you bought it, or how much it was. Only the digital authorization number is used to confirm the purchase. The process is completed by selecting the card you wish to use, then activating the Touch ID confirmation. That is it. No signatures, PIN entries, or ID verification. 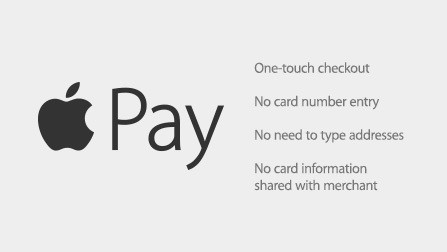 Apple Pay is set to revolutionize the shopping experience by also adding it to online purchases. Major retailers such as Macy’s, Walgreens, Staples, and even Mc Donalds have partnered to bring Apple Pay to users in the near future. Disney has confirmed that Apple Pay will be integrated into their retail stores and all through-out their theme parks by the end of 2014. It will be available first in the US next month, and coming soon to other locations worldwide. After all that has been announced so far, Tim Cook saved time for one last surprise. 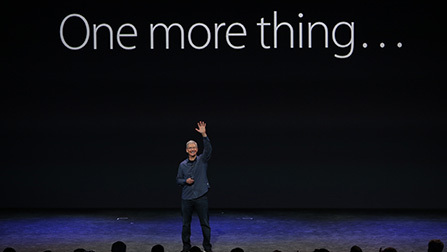 This was his first major product category unveiling, and also the first iconic “One More Thing…” announcement that has been made in a long time. After years of anticipation, hard work, and planning, he unveiled the Apple Watch with an incredibly passionate speech and video. The introduction video showcases an incredible level of style, precision, and design that Apple is known for and packages it within a watch that will inevitably change the way many people experience their lives. A 38 or 42mm display is surrounded by sapphire glass and either stainless steel or aluminum. An 18-karat yellow or rose gold option is also available. A highlight of the event were customizable bands. With dozens of colour and style options, each user will be able to make it their own. 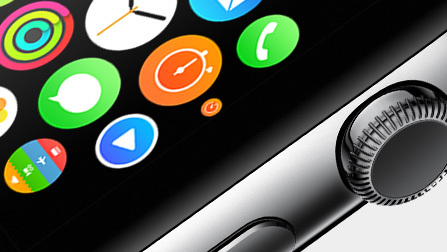 The Apple Watch is separated into three different sub-categories. The standard Watch model features a highly polished stainless steel casing and comes in 18 different models, featuring sport bands, metallic links, and classic leather. The Apple Watch Sport is made of a lightweight anodized aluminum, strengthened by Ion-X glass. The bands in this collection are sweat and stain resistant made from fluoroelastomer for longevity. The third set is the Apple Watch Edition, featuring 6 unique styles of 18-karat yellow or rose gold alongside various leather and sport bands. A Digital Crown is the main highlight of the innovation. This dial gives the user full control of their experience. 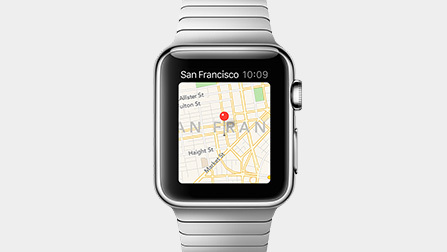 Apps on the Watch are manipulated using rotation alongside a touch interface. The sapphire display has a new layer of touch technology built-in that can distinguish a tap from a press. Apps can convert this data into triggers for certain actions. If you are in the music app, a tap can bring up play controls whereas a press can display shuffle options. The Home Screen features small icon circles for each app and can be navigated using touch and tap combinations. Pressing the Digital Crown acts as a Home button to return to the main screen. The Apple Watch features dozens of new technologies and apps that will assist in changing your every day life. There are too many to list here, but the full briefing can be seen during the conference. The Watch is set to be released in early 2015 and will start at $349. No word was given on internal storage sizes, specific pricing, or battery life. U2 closed out the event with a live performance, followed by announcing that their new album Songs Of Innocence will be released today on iTunes free of charge for anyone with an iTunes account. The album features 11 new songs for fans to enjoy as a gift from Apple. Today’s event proved that Apple can still surprise the world. The entire crowd was on edge during the reveals, and Tim received numerous standing ovations. Look for a full review of the iPhone 6 once it is released next Friday.